During winter, your expenses increase from the cost of heating your home. But, there are some things you can do to save you money on utility bills while still keeping your home comfortable. Here are a few things to consider to heat your home more efficiently this winter. Your HVAC system will heat your home more efficiently if it’s serviced by a professional twice a year. Schedule this service in the spring, before the air conditioner kicks on, and in the fall, before your furnace or heat pump are needed. A certified HVAC service will make sure it’s functioning properly and make adjustments to help it run more efficiently. The HVAC filter catches the dust and particles circulating throughout your home’s air vents. If they get too dirty, they won’t let enough air through to maintain proper airflow, making the unit work harder to get the right temperature. Changing the HVAC filter as often as the manufacturer recommends is important when you want to heat your home more efficiently. 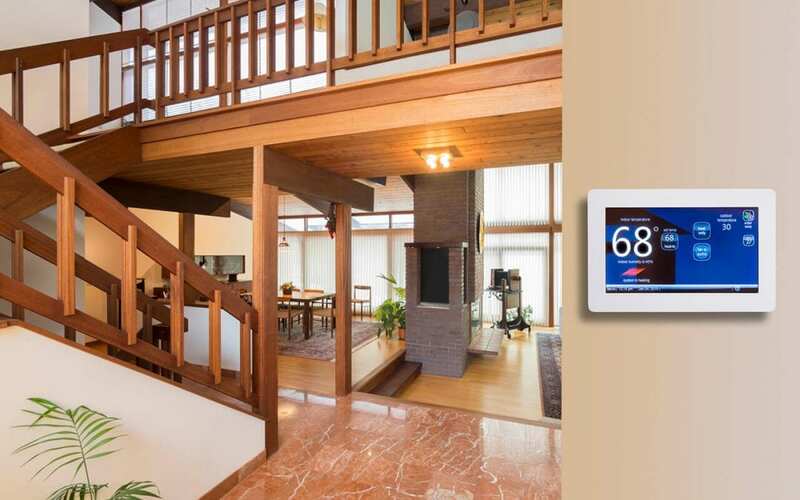 Your heating system is designed to efficiently heat your home based on its size and the dimensions. The vents need to be open and clear to maintain a balanced flow of air. While you may think that blocking or closing some of the air vents will save you money, it actually makes your furnace or heat pump work harder to get the same job done. Rearrange your furniture so that it is not sitting on top of any vents. 4. Heat your home more efficiently by adding insulation. If there are cold spots in your home, you might be able to heat your home more efficiently by adding or replacing the insulation. Especially in older homes, insulation could have gotten wet or deteriorated, making it less effective. Insulation can also shrink around electrical outlets with age. And, sometimes, even in newer homes, an effective amount of insulation wasn’t installed in the first place. The easiest place to add insulation is in the attic, and since hot air rises it is important to have enough there. A thermal imaging home inspection can determine areas that are missing or lacking adequate insulation, so you can add more yourself, or have a professional do it for you. Check your windows and doors to see if you can feel any air coming through. Sometimes, the draft can be so subtle, you may not notice it. A home inspection with thermal imaging can help you pinpoint areas of heat loss so that you can address them. You can use caulk to seal cracks or use weatherstripping for the windows and doors. Setting your heat just a few degrees lower while you are sleeping or out of the home will save you a considerable amount of money on your heating bill and still keep your home warm and comfortable for your family. In the winter, your ceiling fans will help to heat your home more efficiently if they are running clockwise. This will push warm air down away from the ceiling to keep the room warmer. 8. Take advantage of the sun. Letting the sunshine warm a room will keep your heat pump from running as often. Once the sun is gone, the windows can be covered with thermal drapes to hold in the heat. Aztec Home Services provides thermal imaging inspections to Harrisonburg, VA, and the surrounding areas. Contact us to schedule an inspection.